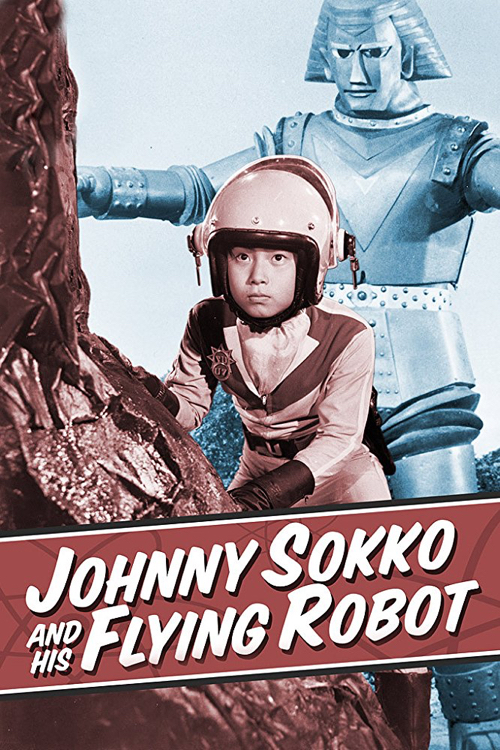 The classic series Johnny Sokko and His Flying Robot celebrated its 50th anniversary this week. After languishing in the grey market for years, fans of Japanese tokusatsu and kaiju were excited to finally see a DVD release by Shout! Factory in 2013. "'Robot, attack! Robot, destroy!' These commands launched a thousand sci-fi fantasies for budding fans of the genre, just as they brought Johnny Sokko’s Giant Robot into imminent battle action! Under the voice control of young Johnny Sokko, the massive, flying metal behemoth would bring his fiery breath, laser eyes, finger-launched missiles and, above all, his physical strength into battle with countless menacing monsters bent on destroying the Earth! This epic fantasy series from Toei Studios aired from 1967 to 1968 and garnered even more fans in after-school reruns throughout the 70s." Like a number of sci-fi monster-related shows from the era, Toei also wove in elements of Cold War themes. More below. What is the show about? Join me for a brief tour: The Earth is invaded by a terrorist group called Big Fire (Gargoyle in the US), led by Emperor Guillotine, who commands his minions of henchman and captured scientists (who make monsters- natch!) from his ship beneath the ocean. Enter Johnny Sokko (Daisuke Kusama in Japan), who meets up with a dashing young man, Jerry Mano (Juro Minami in Japan), on a cruise ship. Johnny discovers that Jerry is, in fact, Agent U3 for a top-secret peacekeeping organization called Unicorn! Jerry’s cover is blown when his pen starts ringing. (oops! sounds like Get Smart). Jerry extends an antenna and contacts his boss at HQ- a rather colorful version of U.N.C.L.E. headquarters. The ship is attacked by a giant sea monster, and our two heroes find themselves castaways on a beach and captured by the alien terrorists. 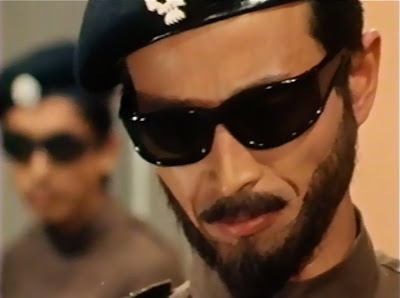 The baddies in Johnny Sokko are designed with a wonderful mix of elements to portray their evil intent- black berets, sunglasses, Nazi salutes, and sci-fi makeup. Jerry and Johnny break free and an intense gunfight ensues that would never been seen in a US-produced kid’s show. Jerry even uses a guard as a shield! The poor henchman doesn’t stand a chance and his pals riddle him with bullets. Even Johnny is armed with a pistol and looks super heroic, despite his tiny shorts. I think the necktie adds some authority! The series is fast-paced and fun. Jerry and Johnny race through corridors and down an elevator, where they discover the Giant Robot and a scientist who has been held prisoner to do Guillotine’s bidding. The man gives Johnny the robot’s control-watch. In James Bond fashion, the heroes blow up the secret lair and shoot it out on the beach. When things get desperate Jerry reminds the kid that he now possesses the watch that controls the robot. The boy flips open the top, makes his first commands, and a franchise is born! Johnny is brought into Unicorn as Agent U7, and joins the secret fight against the alien terrorists. It's interesting to note that as this series was winding down, Gerry Anderson was recruiting another young boy (in puppet form) for a new sic-spy program called Joe 90. It was interesting to talk with my friend, translator Fred Schodt (Astro Boy) about the violence that we see in Japanese pop culture. There is an edge to the storytelling, seen even in live-action and animated shows from the early 1960s, which remains compelling for American viewers. 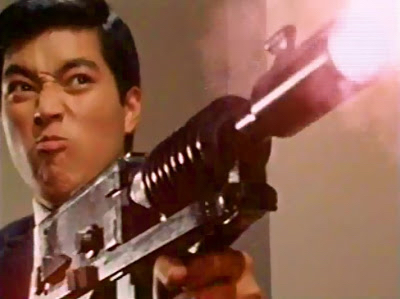 Johnny Quest may have been cool and dangerous for its time, but imagine if Johnny Quest, like Sokko, had been allowed to carry a pistol and command a giant robot! In Japan there is generally a greater distinction between fantasy and reality, which is how creators in Japan have generally explained the graphic tone of their content. They didn’t have a Dr. Wertham, for example, leading a Congressional charge that comics were inciting youth to violence. Fred Schodt agreed, and added that Japan’s low crime rate, gun control, and overall group-sensitivity in the culture would help maintain a boundary between fantasy and what can be expected to happen in real life. But as Japan experiences more of the kind of violence that happens in the US, he added, maybe those lines will blur and the graphic tone will become an issue. Now, back to that giant robot. What kid would root for a powerful mascot armed with super gadgets? 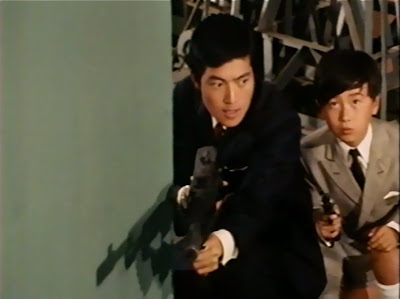 While the secret agents in the show are talking into their pen communicators and shooting it out with baddies, Johnny’s robot has quite an arsenal at his disposal: Finger Missiles, Back Missile, Bazooka Cannon (which fires out of the top of the robot's head), Eye Ray/Beams, Flamethrower (from his mouth) and Electrocution Wires. Don't mess with Johnny. If you are a fan of Japanese monsters, heroes, and toys (and love spies! 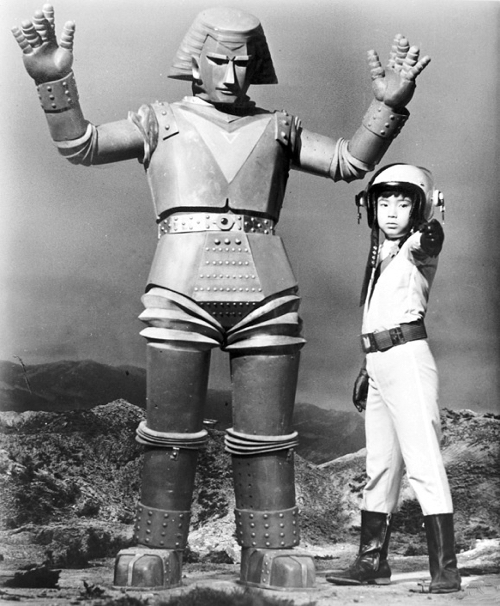 ), Johnny Sokko and His Flying Robot (Giant Robot) is a fantastic adventure! Learn more about the series here. Related posts: Skyers 5, U.N.C.L.E. Japanese Editions, James Bond Japanese Editions, Ian Fleming's Japan, Green Hornet Manga, U.N.C.L.E. and Batman Manga, Spies Robots & Monsters, Spies Robots & Monsters II, Marine Boy, Interview: Kevin Dart's Powerpuff Girls. Selected Spy Vibe Posts: Interview: Trona Robbins, Eddie Izzard, The Prisoner Capt Scarlet 50th, Hugh Hefner R.I.P., Jack Good R.I.P., Interview: Shaken Not Stirred, Callan 50th, Spy Vibe Radio 7, The Prisoner 50th Event, Spy-Fi Event, Kaho Aso 007, Two Million, Bo Diddley, Carnaby Pop, Le Carre Events, Billy Bragg Skiffle, Elvis 68, Jack Kirby The Prisoner, Casino Royale Concert, Review: The Prisoner Vol 2, Interview: The Prisoner Essential Guide, Maud Russell Mottisfont, Spy Vibe Radio 4, Batman Gallants, Adam West R.I.P., Village Triangle, Roger Moore R.I.P., Spy Vibe Radio 3, Sgt Pepper 50th, Satanik Kriminal OST, 60s Overdrive, Make Love in London, Spy Vibe Radio 2, Spy Vibe Radio 1, James Bond Strips, Propaganda Mabuse, Interview: Police Surgeon, XTC Avengers, 1966 Pep Spies, Batman Book Interview, Exclusive Fleming Interview, Avengers Comic Strips, Robert Vaughn RIP, UNCLE Fashions, Thunderbirds Are Pop!, Interview: Spy Film Guide, Lost Avengers Found, The Callan File, Mission Impossible 50th, Green Hornet 50th, Star Trek 50th, Portmeirion Photography 1, Filming the Prisoner, Gaiman McGinnins Project, Ian Fleming Grave, Revolver at 50, Karen Romanko Interview, Mod Tales 2, Umbrella Man: Patrick Macnee, New Beatles Film, The Curious Camera, Esterel Fashion 1966, Exclusive Ian Ogilvy Interview, 007 Tribute Covers, The Phantom Avon novels return, Ian Fleming Festival, Argoman Design, Sylvia Anderson R.I.P., Ken Adam R.I.P., George Martin R.I.P., The New Avengers Comics, The Phantom at 80, 007 Manga, Avengerworld Book, Diana Rigg Auto Show, The Prisoner Audio Drama Review.